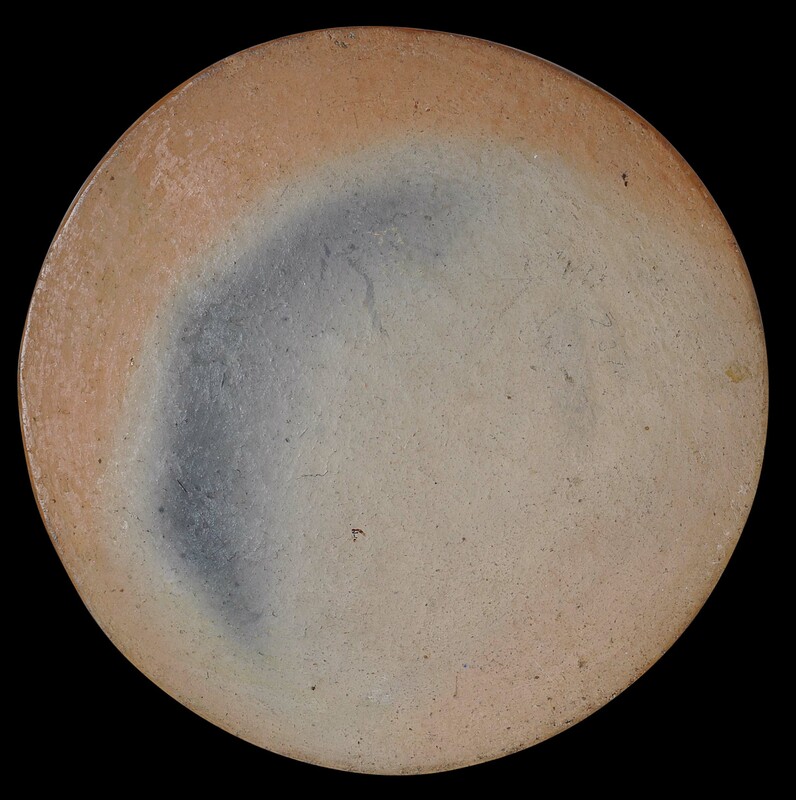 This round tile is made of fired earthenware and decorated with various ochre-coloured slips. It is flat and painted with various nari-lata-type figures amid large katiri mala flowers and foliage. The decoration and conception is typically Kandyan in design. The figures are represented in a strongly linear style against a flat background. According to Coomaraswarmy (1908, p. 225), the red paint on earthenware is made from grinding up with water certain ferruginous nodules calledgurugal, and white paint is similarly made from kaolin. Sinhalese potters (badahelayo) made a variety of utilitarian items often decorated with traditional Kandyan motifs. The firing was done in a traditional kiln that was low with stone sides, and had a domed covering of wet clay and sticks. The clay used tended to be alluvial in nature and available from many valley rice fields. The tile itself is without chips, cracks or repairs. The decoration shows some past loss from weathering or flaking, but is in a stable condition. A dating of 1800-1850 has been used based on the dating the Victoria & Albert Museum gives for its tiles. Pal (1987, p. 119) gives a dating of late 18th century for some similar tiles. 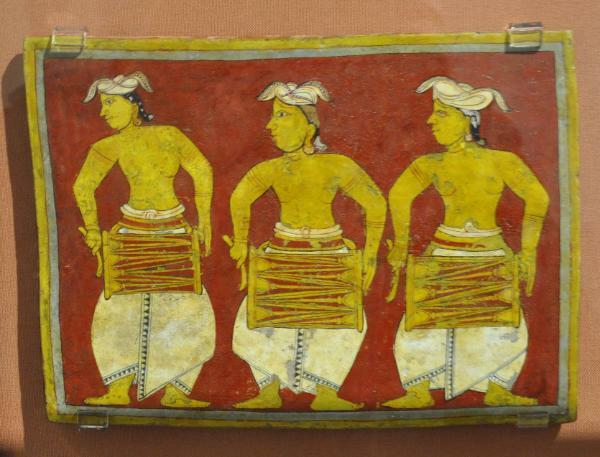 The last image shows a Kandyan tile displayed currently in London’s Victoria and Albert Museum, attributed to 1800-1850. 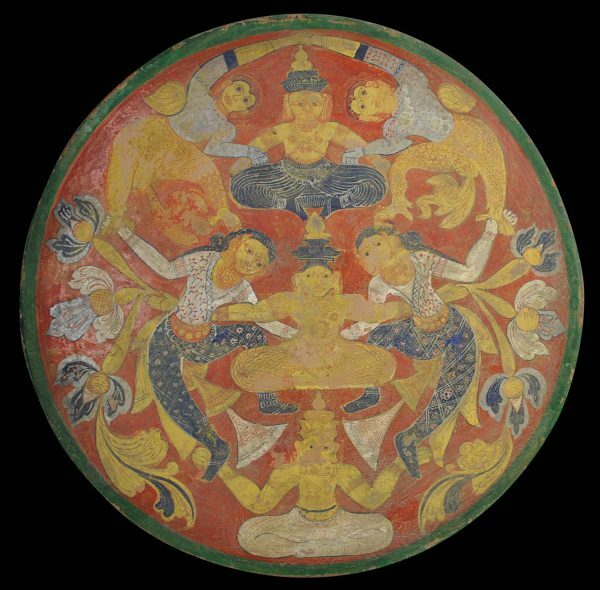 Pal, P., Icons of Piety; Images of Whimsy: Asian Terra-cottas from the Walter-Grounds Collection, Los Angles County Museum of Art, 1987.